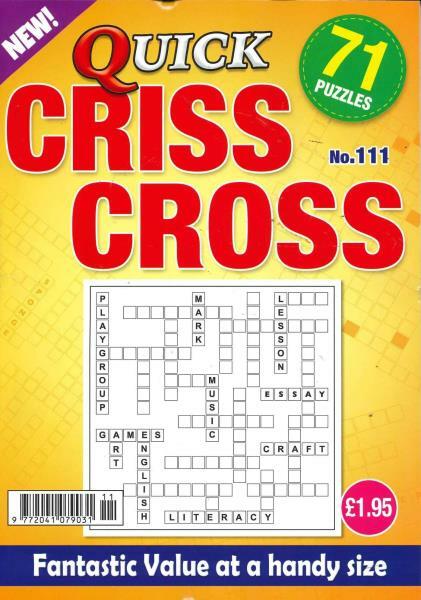 Quick Crisscross is a magazine where you can find very many kinds of crosswords and puzzles to solve. It is released on a monthly basis, which means 12 issues a year. The magazine is just the perfect magazine for you if you have a knack for solving puzzles and crosswords. The magazine provides a large number of puzzles meaning that you would never run out of new puzzles. It is always a pleasure to present a few brain teasers to one’s brain and see how we respond to them. Besides, it gives a lot of confidence and self-satisfaction to one if you are able to solve a crossword fully on your own. An interesting thing about Quick Crisscross Magazine is that they provide the answers to all of their puzzles at the back. This means that you can easily check your answers against the expected answers at the end of completion of each puzzle or crossword. Another feature of this magazine is that they grade the puzzles from easy, medium to hard. This gives the opportunity to the person who wants to solve the crisscross to choose exactly which type of puzzle he/ she wants to do, depending on the mood they are in, and the amount of time they have to spare for the solving of the crisscross. The magazine provides for very good relaxed entertainment for the reader. This magazine allows the reader to do some crisscross solving whenever they are free, whether it is during a tea break, or during a leisurely lazy Sunday afternoon. It is always a pleasure to present a few brain teasers to one’s brain and see how we respond to them. Besides, it gives a lot of confidence and self-satisfaction to one if you are able to solve a crossword fully on your own.